Also known as drag conveyor in which the open links of a chain with various flight configuration drag material along the bottom of a trough. Whizz offers a wide range of drag chain conveyors according to the customer requirement.The conveyor consisting of wooden or steel plates attached to endless chains and running in a trough through which the material is dragged. Drag chain conveyors handle a wide range bulk materials ranging from Ash to Zinc. The versatile design and efficient utilization of space means the conveyor has a smaller footprint compared to other conveying technologies and a smaller, more energy efficient drive. Our Drag Conveyor moves material distances ranging from 20 to 200 feet or more. Whizz Drag Conveyor is equipped with the industry’s most durable chain; an exclusive drop-forged, case hardened formula that contains a hard exterior coupled with a softer, malleable core. This combination provides the highest level of abrasion resistance while mitigating the risk of stress and breakage. The flights are fixed between two strands of chain, drags the material from feeding end to the discharge end in open or closed trough. These are available in different widths and lengths as per the site requirements and are also used for handling slightly sluggish, loose or lumpy hot material. Sprockets, Chain and horizontal flights are driven by geared motor to move material. Drag Chain Conveyors are designed for horizontal, inclined and vertical transport of sawdust, chips and other bulk goods. We provide customized solutions to our clients as per the site situations.Single or multiple chain strand enclosed trough conveyor system is continuously driven through a motor and geared reducer to ensure power consumption is low for each application. 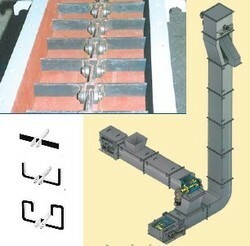 The Drag Chain Conveyor will have following technical parameters. Max. Trough length : 200 Feet approx. Operating Speed: 60 to 180 Feet per min. The drag chain conveyor is ideally suited for transporting empty or loaded pallets, heavy products, and many types of flat-bottomed parts. Since it has few moving parts, the drag chain conveyor provides a smoother movement of product. Adjustable floor supports are available. Abrasive materials over short distances including mill rejects, ash from boiler, economizer, gas air heater, cyclone and electrostatic precipitator or fabric filter. A loss in weight feeder is a gravimetric metering device that receives material from an upstream supply and accurately doses the material into a process at a predetermined feedrate, typically through a screw (helix), or vibratory tray. The feeding device with a hopper containing the product to be fed is placed on a platform scale or suspended on load cells. The product is discharged from the hopper by the metering device and the resultant weight loss per unit of time is determined by the weighing and control system. This actual weight loss per unit time is compared to a desired weight loss per unit time. Any difference between the actual and desired weight loss per unit of time results in a correction to the speed of the feeding device. When the hopper content reaches a predetermined minimum weight level, the control by weight loss is briefly interrupted and the hopper is refilled. During the refill period, the controller regulates the speed of the feeding device based upon the historical weight and speed that was determined during the previous weight loss cycle. Capacity Starting from 50 kg/hour. Optimum Loss In Weight measurement results are obtained where the product being handled has good linear volumetric feed from 0 to 100% of the required flow rate. In this situation expect ± 0.5% or better accuracy. Providing the controller can measure the change in weight, very low flow rates can be achieved. 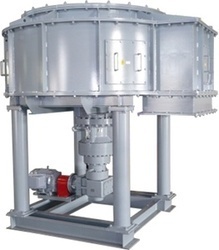 The limit on throughput of a loss in weight system is the ability to refill the loss in weight hopper in the required time frame. Subject to the characteristics of the bulk material, accuracy of ± 1.0kg or better can be achieved. 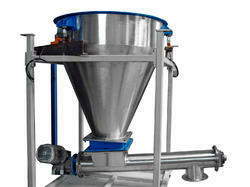 Active Weighing Solutions Loss in Weight Feeders can be belt fed, screw fed, rotary valve or rotary table fed. The Feeders can be used for loss in weight and gain in weight measurement and control. Commonly utilized for Plastics, Bulk Foods, Recycling, Concrete, Cement, Aggregates, Grains, Fertilizers, & all dry powders etc. We have been widely appreciated in the market for providing supreme quality Table Feeder to the customers. These products are highly demanded by the clients for their effective usage in large scale industries. The entire range is assembled using quality-tested components, under the expert guidance of our team of experienced professionals. Whizz Rotary Table Feeder will consist of a power driven circulated plate rotating directly below a hopper / bunker. A feed collar located immediately above rotating table used in conjunction with an adjustable plough, determines the volume of material discharged. The lower edge of the feed collar will be parallel to the table with a predetermined gap from table top. This arrangement permits equal quality of material to flow under the collar and spread over the table as it resolves. The material is then ploughed off into the discharge chute. The plough inside the feed collar. · The table will be fabricated from 12 mm thick M.S. plates and will be mounted on the output shaft of the gearbox. The table will be driven from the output shaft of the reduction gear.